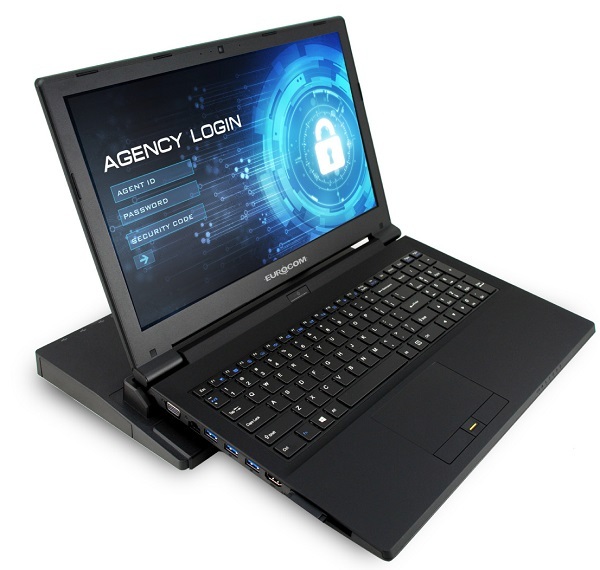 Eurocom launches Commander I, an enterprise class laptop designed for secure computing, connectivity and expandability with a built in Smart Card Reader, TPM 2.0 and hot swappable docking station. The EUROCOM Commander comes standard with a variety of features for total connectivity and total security – the ultimate enterprise class business laptop. A Smart Card reader, finger print scanner, TPM module and a Kensington lock port keep your hardware and data secure while the docking station, express card slot and optical drive provide expandability and efficiency. “EUROCOM Commander enterprise-class laptop is designed for government, healthcare and corporate professionals engaged in mission-critical computing. It provides both secure access via Smart Card and Fingerprint reader as well as data encryption via TPM 2.0 module and data backup via a storage drive in the docking station.” Mark Bialic, Eurocom President. Designed for secure computing, connectivity and expandability! The Commander comes standard with a built-in Smart Card Reader, TPM 2.0, and Fingerprint Reader along with an Intel vPro 1Gigabit LAN l219-V, hot docking station port and Expresscard 54/34 slot. It is pre-wired for LTE or UMTS/HSPA WAN computing too. “An optional hot docking station allows easy deployment outside of the office making the Commander a single computer solution for the user and reduces costs of maintaining multiple systems.” Mark Bialic, Eurocom President. Another feature that makes the EUROCOM Commander unique is the display panel that can lay flat with a 180 degree travel and a display image that can flip upside down to show those around your projects or presentations. Processing power is provided through an upgradeable LGA 1151 socket and Intel Q170 chipset supporting 12 nm, 32 watt Intel Core i7-6700T, 6600T, and 6500T processors managing up to two 16 GB DDR3 SODIMM for a total of 32 GB of memory. Intel HD Graphics 530 is supported to provide potent graphics horsepower to plow through day to day tasks and workloads. The EUROCOM Commander can support three storage devices, including an M.2 SSD SATA PCIe Gen2 x2/x4, one 9.5 mm HDD/SSD SATA and another 7mm storage drive through a storage drive bracket installed in the place of the optical drive, for up to 3.5 TB of storage. All three storage drives are easily accessible and upgradeable for users to continually customize their system or if, unfortunately, a storage drive fails, to replace it. Eurocom takes security very seriously so we equipped the Commander with a Smart Card Reader, finger print scanner and Kensington lock port to keep your data and hardware as safe as can be. The Commander is prewired for an upgradeable 4G LTE or UMTS/HSPA+ M.2 3042 card module support, through an M.2 slot, so users can easily add an M.2 internet module with a SIM card to have a reliable internet connection on the go. The EUROCOM Commander is compatible with a powered, hot swappable docking station for ultimate convenience to remove the cable mess from your desk, increase connectivity and expandability, while providing easy data backup by the press of a button. The docking station weighs under 2 pounds and measures 15 inches by 8 inches. The docking station has a bay that can support a storage drive or optical drive. The storage drive can act as a data backup for quick and easy data security and redundancy. -Display: 15.6-inch FHD 1920-by-1080 pixels; 16:9 panel; 3.8mm; eDP; LCD can be open up to 180 degrees.